(Newser) – United Airlines abruptly replaced its CEO as a federal investigation continued into whether the airline gave preferential treatment to the former chairman of the agency that operates the New York-area airports. 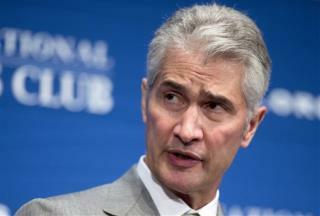 United Continental Holdings says Jeffery Smisek and two other senior executives have stepped down. Federal prosecutors are probing United's ties to David Samson, the former chairman of the Port Authority of New York and New Jersey. United began a direct flight between Newark, NJ, and Columbia, SC, where Samson has a summer home, while he was chairman and ended it days after he resigned last year. United, the dominant airline at Newark Liberty International Airport, was negotiating with the Port Authority over projects at the airport at the same time. Ooo, what a big bad crime! Come on, spit out the bait. This has to be a cover story for someone's grudge or revenge obsession, and that someone is very, very powerful. Seriously, preferential treatment is foundational to all business strategies. Isn't the one getting the bribe supposed to be punished? "Smisek would get a severance payment of $4.9 million and be eligible for a bonus. Smisek, 61, will have health insurance until he's eligible for Medicare and keep flight benefits and parking privileges for the rest of his life. He gets to keep his company car." The CEO party continues. FU your company and walk away with gold. He's not getting as much as the fired JCP CEO, but he probably didn't damage United as badly. I think you get extra when you really destroy your company.